This exhibition is the first in a new series of six monographic exhibitions at Louisiana focusing on a new generation of architects that is responding to the world around us, dealing with social challenges such as overpopulation and climate change. Next year will be the turn of the uncrowned champion of this movement away from big starchitecture, Chilean architect and Venice Biennale 2016 curator, Alejandro Aravena. The exhibition on Amateur Architecture is spread across the lower floors of Louisiana, where bamboo-clad walls attempt to transport you right into the heart of the studio’s buildings. 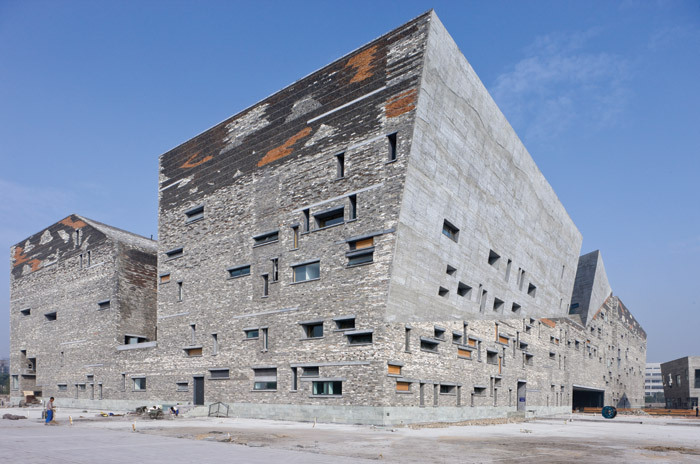 The first project on show, the vast Xiangshan Campus at the China Academy of Art (2004–07), provides a solid introduction to the studio’s processes and sources of inspiration. Inspired by an 11th-century landscape painting by Li Gonglin, which plays with scale and perspective, so that many scenes are experienced at the same time, the 22 campus buildings respond to one another, as if they were sketched out in one clean sweep of calligraphy, transitioning from openings and gangways to inner courtyards and ponds. 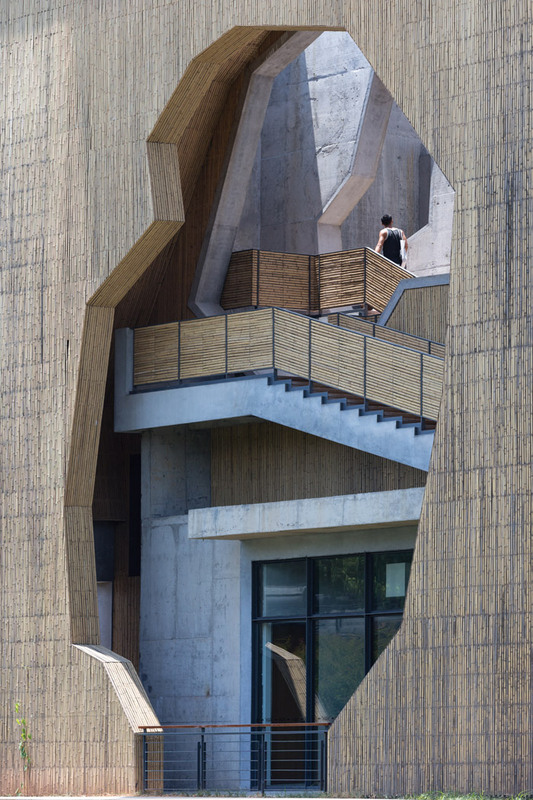 The Wa Shan Guesthouse, a visitor centre built on the campus in 2013, is described by Amateur Architecture as a ‘vertical landscape’, composed of layers of materials, textures and shapes. 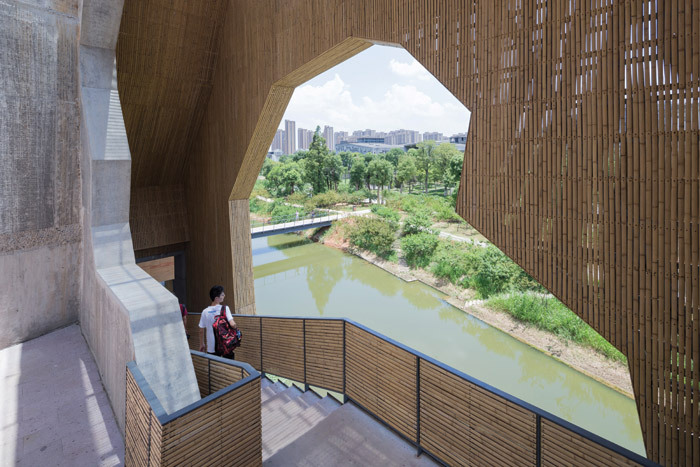 The building is envisioned as a ‘mountain’ — ramps weave past cave-like openings up to the wooden beams of the roof, the structure a contemporary interpretation of classical Chinese pagoda designs. A series of footbridges allows visitors to climb across the roofscape and reconnect with their surroundings. For Wang, landscape and building should always be in coexistence. In the gallery below, a collection of material studies displayed in wooden pallets (shown originally in Venice) help illustrate two of the studio’s most well-known projects. 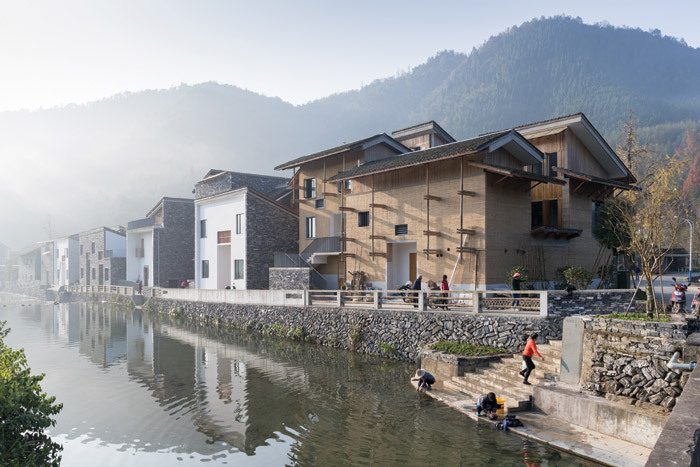 When Amateur Architecture was commissioned by the government to design the Fuyang Cultural Complex in Hangzhou in 2012, Wang Shu would only take on the project on the condition that he could restore the rundown houses of Wencun, a remote mountain village that has suffered from mass rural-urban migration. A video depicts the ongoing rebuilding as the new village grows organically out of the old. Amateur Architecture developed a series of housing typologies, all constructed around a traditional inner courtyard, that could be used to preserve the diversity of the local building tradition. While many of the villagers wouldn’t have thought that the old buildings were worth preserving, through the holistic process, Shu says, ‘villagers gradually understood the beauty of their place and their traditions — the value of the original life’. Similarly in the city of Ningbo, two hours outside Hangzhou, 30 villages were razed to make way for the new Ningbo History Museum (completed 2008) and a huge, landscaped square. Amateur Architecture salvaged material from the demolished houses and collaged bricks, rubble, tiles and concrete, old and new, together into the museum’s facade. A traditional construction technique, wa pan, that combines different types of stone into irregular patterns was resurrected by local craftsmen for the project. This new monument, originally pictured in the masterplan as a skyscraper, therefore takes on a greater meaning for the local people, bystanders to the unprecedented change going on around them. This exhibition provides a wonderful insight into Amateur Architecture Studio’s intentions and methods for those unfamiliar with its work, and a step into its buildings for those who haven’t made it yet to their remote locations.